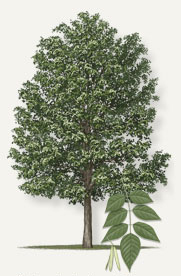 Ash trees range in height from 80 to 120 feet and are plentiful throughout the United States. Ash makes up 4% of the commercially available hardwoods in the United States. Its sapwood is light colored to nearly white, while the heartwood varies from grayish brown to pale yellow streaked with brown. Although usually straight grained with a coarse texture, ash can have some unique grain patterns that enhance its beauty. Ash has good working properties, nailing, screwing and gluing very well. It is relatively lightweight for its strength, stiffness and shock resistance and has excellent flexibility and bending qualities. It takes stains and polishes well. Best known as the wood used to make baseball bats due to its good shock absorbency. It is used for furniture, flooring, cabinetry and millwork. It is also a popular wood for tool handles and sporting goods such as hockey sticks, billiard cues, skis and oars. Ash also has a rich history in folklore and natural medicine. It was once believed to be a cure for ailments like earaches, snakebites, warts and rickets.